We have a large selection of props if you would like to incorportate them into your shoot, We have a trilby, feather fans, a cane, feather boas, rose petals. All of which will be made available for you if you wish. 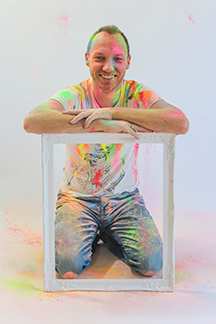 A powder paint portrait photography package is a fun and relaxed session capturing a colourful range of images. This package is ideal for individuals, couples, siblings, families and friends. The powder paints used are non toxic and environmentally friendly. We recommend you wear white or black so the colours show up the best but any clothing is fine. The option to do this as a naked photo shoot is also available should you wish. The powder paint washes off skin and clothing. You will be sprinkled with a range of differently coloured powder paints and then photographed in a range of poses for up to one hour.